Jimmy Crocker, a.k.a. Piccadilly Jim, is a lively young American ex-newspaper man who meets Ann Chester, the girl of his dreams, in London. Problem is, Jim once wrote a bad review of her first book of poetry. They set sail to New York together with Ann still not knowing he's the dastardly critic! Add a brilliantly colourful Manhattan setting, an unlikely butler, odd spies, eccentric 'tecs, scientific secrets, plus an odious boy called Ogden, and the ingredients are here for one of P.G. Wodehouse's most dazzlingly comic feasts. Wonderfully funny listening that keeps up a swift pace, thanks to the classic combination of Martin Jarvis reading Britain's finest comic writer, P.G. Wodehouse. ©2005 CSA Telltapes Ltd. (P)2005 CSA Telltapes Ltd.
Another great story from the incomparable Wodehouse, a new set of intriguing characters, getting themselves in unlikely muddles and brought to life so well by Martin Jarvis. You can foresee the disasters coming, but as you can be sure it will all work out happily in the end, relax and enjoy with a gentle smile on your face. I first listened to Leave it to Psmith and liked it. I liked this one even more. For anyone that likes the writing style of Wodehouse you'll like this one. 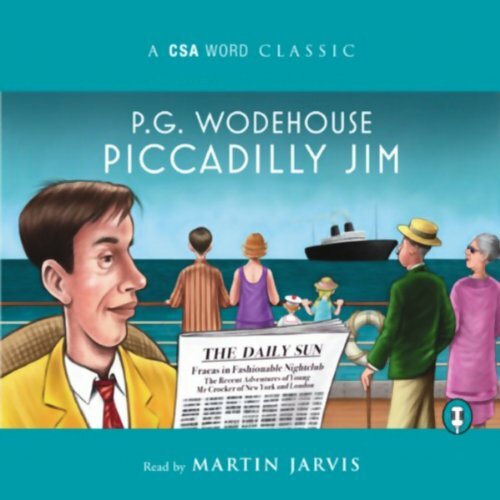 You simply cannot go wrong with Wodehouse and a narrator like Martin Jarvis. I would go ahead and say that Jarvis is the definitive narrator for Wodehouse. Piccadilly Jim is a great example of this. Brimming with wit and narrated with equal aplomb, this is a marvellous audiobook. A true must-have. My first with PG Wodehouse and surprise it's one of the Classic literatures. But it doesn't stop me to love the story so funny and full of adventure. I love to venture another PG Wodehouse's works available at Audible. What made the experience of listening to Piccadilly Jim the most enjoyable? He is a master of comic accent, his Americans are particularly fun and well realised. Theoretically you could, and I might do on second and third sittings in future. What a combination! Wodehouse wit and Martin Jarvis's perfect delivery. Guaranteed to cheer you up. Warning: may cause laughing out loud on public transport. Be careful! Very fun and entertaining listen. Martin Jarvis does an excellent job differentiating the colourful array of characters who are woven together in one of Wodehouse’s whimsical webs. A thoroughly diverting plot thickens until quite beyond even the most suspicious of the poor fools as they busily tangle themselves up in further threads!